TUSCALOOSA, Ala. — A recent renovation of The University of Alabama Gorgas House Museum has been recognized as a top project by two national building groups. UA’s Gorgas House Museum renovation was named top historical renovation project under $2 million from Associated Builders and Contractors and top renovation project under $5 million from the Associated General Contractors of America. The awards were given to Brice Construction, contractor of record for this UA project. The Gorgas House received a $1.1 million major renovation that included the efforts of the contractor, Construction Administration, Campus Planning and UA Facilities and Grounds. Exterior renovation improvements were made to the masonry, roofing and gutters/downspouts, as well as the landscaping. Attention to the historical elements of the project included installing custom wood windows with restoration-style glass and creating a historically accurate wooden picket fence. The historic home’s award-winning renovation was a team effort, Wuebold said, including the work of Rob Cooper, project manager; Mike Spooner, building envelope; Bonner Lee, campus landscape architect and Bryant Anderson, grounds department manager. The Gorgas House was built in 1829, two years before the University opened, and it was the first structure on campus. It is also one of the few campus buildings that survived the Civil War. When first constructed, the building was used as a guest house for visiting dignitaries and professors as well as a dining hall for the students. In the late 1840s, the hall was remodeled as a faculty residence that during the Civil War belonged to professor John Wood Pratt. In 1879, UA President Josiah Gorgas, and his wife, Amelia, began living in the home, and their family continued to occupy the home until 1953. A year later, the house was re-opened to the public as a historic house museum, featuring 19th-century artifacts and furnishings belonging to the Gorgas family. Today, the building remains open to the public, and it can be used for a variety of events, said Erin Harney, director of the Gorgas House Museum. The Gorgas House Museum is open Monday-Friday from 9 a.m.-noon and 1-4:30 p.m., or by appointment by phoning 205/348-5906. Admission to the Museum is $2 for the general public and free for UA students, faculty and staff. The Gorgas House Museum can also be rented for receptions, business meetings and student-organization events. The UA Gorgas House Museum is part of UA Museums. 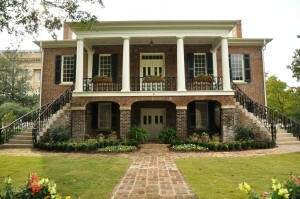 For more information about the Gorgas House, contact Harney at 205/348-5906, eeharney@bama.ua.edu.